One of the first modern Iranian films, Ebrahim Golestan’s Brick and Mirror was made at a crucial point in the country’s history, ten years after the 1953 coup and during the June uprising of 1963. Some critics saw in the film an Iranian version of neorealism; however it’s clear from the beginning, as Hashem (Zakaria Hashemi) drives his taxi along the dark streets of Tehran and a poem is read on the radio by Golestan himself (“The night was hard, the night seemed long . . . and fear was life’s only sign”), that the film will surpass reality. 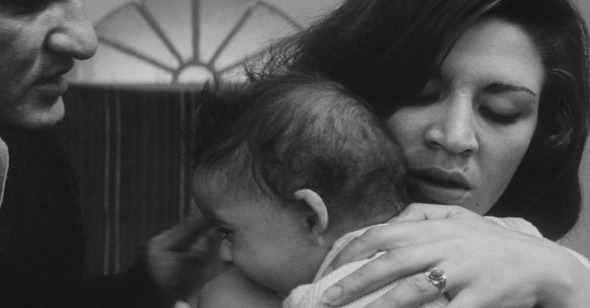 Minutes later, Hashem finds a baby in the car’s back seat and tries to pursue the woman (played by The House Is Black director Forough Farrokhzad) who abandoned the child before disappearing into the night. Unable to find her, Hashem enters a forsaken ruined building, an allegorical realm where he meets a lonely, perhaps mad woman who talks about her life as though she’s accessing a repressed collective memory. When Brick and Mirror was released in Iran, it was harshly condemned for its bleak ending, slow pace, and lack of plot. But through an episodic narrative structure in which our male protagonist encounters a variety of people and situations, Golestan creates a network of peculiar intimate encounters, boldly criticizing Iran’s social structure and political impasses, and exploring notions of responsibility, corruption, patriarchy, fear, idleness, and hope. All of these scenes and discussions are built around the presence or absence of the baby, who becomes a symbol of hope in a society gradually succumbing to darkness. The longest sequence, placed in the middle, is like a microcosm for the entire film, a distillation of what Brick and Mirror is trying to convey. It’s a 35-minute confrontation between Hashem and Taji (Taji Ahmadi), set in a tiny room, where we experience claustrophobia, fear, and tension along with them. This lengthy passage, realized through the rhythm of the dialogue and through the gestures, postures, and moving bodies of the actors in a confined space, expands, intensifies, and evolves as it moves along, ultimately revealing the dualistic cosmology of Persian mythology and poetry upon which the film is based: the film’s very title (taken from a line by 12th century poet Attar) evokes femininity and masculinity, night and day, darkness and light, interiority and exteriority, family and society, fear and responsibility, innocence and evil. Through this experience we come to yearn for a sign of hope, as the woman does. At first, when they enter Hashem’s rented room, Taji sits down and puts the baby on the floor, but Hashem, standing in distress, is too anxious to calm down. The camera follows him in medium shot as he walks around the room to check every window, to see whether or not the neighbors are watching. Taji and the baby remain out of the frame, but the baby’s crying, which, along with their ping-ponging dialogue, intensifies the situation. They talk about preparing hot water to wash the baby, but the tone and rhythm of their conversation sometimes seems overtly stylized and poetic. After Hashem goes out for the second time to bring a washbasin, Taji gets up to boil water in the kettle. Guided by her maternal instincts, she makes the space her own: now she has power both over the man and the camera, and she is happy and confident. The process of boiling water and washing the baby is depicted with meticulous detail and in real time, which creates an atmosphere of mutual collaboration and understanding. The man and the woman are united for the first time in care for the child, even though Hashem is constantly complaining. He is afraid of anything new, even of his own feelings, and pathetically tries to preserve his miserable life. After that the baby is full and calm, the encounter enters another phase. Hashem, still standing, takes off his clothes and reveals his athletic body and some white patches on his skin, which according to an interview with Golestan, inspired the director to choose Hashemi for this role. The white patches on his back have double meaning, and the effect is twofold, as they represent a symbolic fight between darkness and light on the body of a man who himself is struggling. On the other hand, the white patches act as what Roland Barthes called punctum in photography: “It is this element which rises from the scene, shoots out of it like an arrow and pierces us.” Barthes continued his discussion in Camera Lucida by describing the punctum in certain photos: “This particular punctum arose great sympathy in me, almost a kind of tenderness…” It is true that his body is powerful, and that Hashem as a man in a patriarchal traditional society talks harshly and curtly with Taji and intimidates her, but still he is weak, fearful, and desperate, and will eventually lose both Taji and the child, the light of his life. Hashem tells Taji about the evil eyes, wicked tongues, and black hearts waiting outside the room to haunt them, but Taji keeps talking to the child, as if she does not want to hear his negative words. Instead she asks the baby, “Do you know what evil is . . . Do you know what fear is?” Then Hashem turns off the lamp, commencing a literal battle between the light and the dark. Finally Taji, who hates the dark, persuades Hashem to turn on a flashlight. They make love in its dim light. The camera lingers on light; darkness is defeated. When the sun rises, Taji gets up early and for the first time looks out of the window to watch the sparrows as they sing. She tells Hashem that they can keep the baby and raise her together, but he does not understand her. Their ultimate conflict is represented through fast cuts, which alternate between Hashem nonchalantly exercising and Taji remaining calm but serious. Hashem finally persuades Taji to let him take the baby to the police station and begin the formalities for adoption. When Hashem leaves with the child, the camera stays with Taji, who is suffering in agony. We see a close-up of her feet as she walks and picks up a wristwatch from the floor. She tries to set the time but suddenly seems overwhelmed, perhaps afraid of the long time that she should wait, and maybe she has anticipated the bitter truth that she will never see the child again. There is no need for us, as viewers, however, to endure the long wait, as a cut takes us to the orphanage where Hashem will eventually leave the baby, and where, later, a devastated and despondent Taji will realize that she cannot save all the innocent children who yearn for her attention. The final image of this sequence, a close-up of Taji’s horrified face covered by her hands, is intensely unsettling. Over the course of these 35 minutes, the protagonists’ deepest dreads and desires have been revealed across various stages of confrontation, through emotional outbursts and fleeting moments of mutual understanding. Taji has already lost all that she has fought for; however she will continue to fight. She is at once a figure of hope and a symbol of fading light.